We’re always looking for ways to reinvent classics— and what could be more classic than a hamburger? Our plant-based burger recipe is a healthy spin on the all-American classic. Subtract: the sodium, red meat and potential mystery ingredients found in a standard burger. Add: beets, beans, a medley of vitamins and minerals and the result is our truly delectable beet burger. You can make our beet burgers in the standard burger-size, slider size, or bake them in a mini muffin pan to make even smaller burger bites. Kids tend to love these as minis, along with a fun dip such as sour cream with chives or an Indian raita. It’s a sneaky way to add more vegetables and nutrients into our little ones’ diet. Beets are a robust source of fiber, vitamin C, magnesium and potassium. Black beans add heartiness to the burgers, as well as added protein, vitamins and minerals. Quinoa (a Yumi favorite!) is high in protein, and contains all 9 essential amino acids. To top it all off, we’ve added onion, spices, and flax meal to really pack in the flavor. Beets. Black Beans. Quinoa. Onion. Spices. 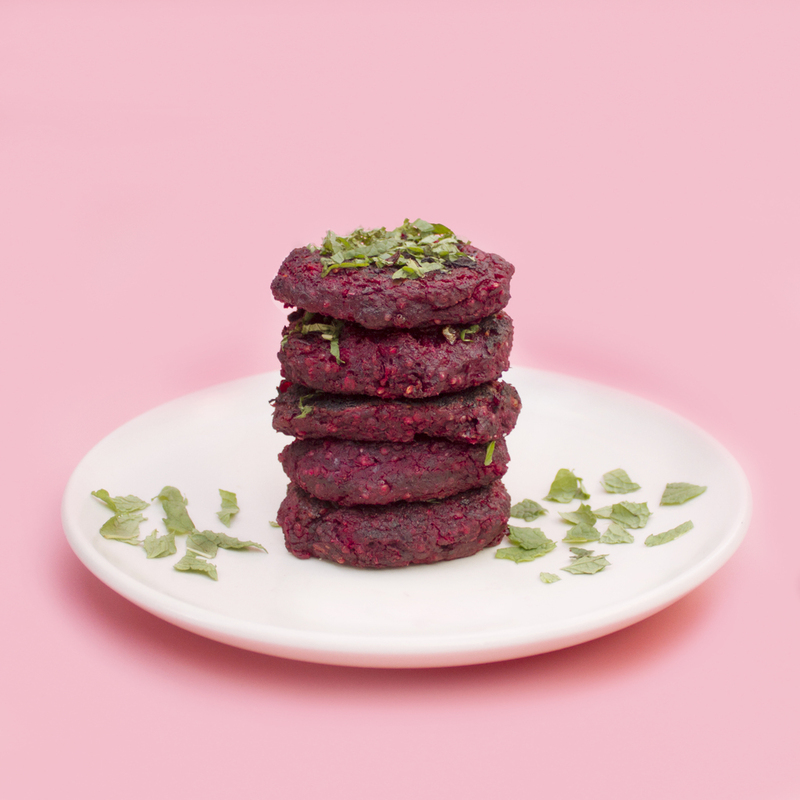 The grown-up version of Yumi's Beet Burger blend. In a satué pan, add in onions and olive oil. Sauté until the onions are soft and translucent. In a large blender or food processor, combine cooked onion, shredded beets, quinoa, black beans, flax meal, arrowroot powder, cumin, paprika, black pepper and sea salt. Pulse the mixture (do NOT blend!) until the ingredients are well-mixed, and some texture remains. The mixture should resemble raw meat. Remove the mixture from the blender, and place in a large bowl. Using an ice cream scoop, scoop the mixture onto a parchment paper-lined baking sheet. Gently press the mixture down flat using a spatula. Once all of your patties have been formed, bake them in the oven for 30-45 minutes, flipping halfway. This time will vary depending on how thick you made your patties. Serve your burgers on their own, or with all the classic burger toppings. Load it up! *Need help shredding? You could use an old-fashioned cheese grater, or you could get your hands on this salad shooter. It’s a major time saver - so naturally, we love it. *When making quinoa, add one part quinoa and 2 parts liquid. Rather than just adding water, we like to cook our quinoa in vegetable broth for an extra flavor boost. For our Beet Burgers, we cooked 1/2 cup quinoa in 1 cup of vegetable broth.